The Case Eagle - Old Abe - is a well known industrial trade-mark throughout the main streets and countryside's of thousands of cities and hamlets in the United States and civilized countries the world over. King of the air, the eagle is an established symbol in American life and heritage. The Case Eagle Old Abe is far more than merely a trademark. He is a character out of history, a bird with a personality and a story all his own. The story begins in the early spring of 1861. In the wild north woods of Wisconsin, along the historic Flambeau River, the Chippewas Indians had just set out on their annual sugar making pilgrimage. Atop a great pine along the trail was a nest of mud and sticks and in the nest, an eaglet The Indians felled the tree and took the eaglet captive. The bird was still too young to fly. Chief Sky, leader of the Chippewas, carried the eaglet back to Jim Falls, Wisconsin, as a pet. There, Thunder of Bees, son of the Chief, bartered the bird for a bushel of corn to a settler named Daniel McCann. Remarking on the incident many years later, a poetic commentator wrote: "And for this paltry sum was a noble bird sold from freedom to captivity; from barbarism to civilisation; from the murmur of pines to crash of battle; from obscurity to fame." Growing eagles make poor pets - even for the hardy children of pioneer settlers and when the bird reached enough growth to attempt escape, McCann determined to sell him. The eagle was already magnificent in appearance and displaying much spirit. During those early days of the War Between the States, men were being recruited for service. Soldiers have a weakness for mascots, so McCann took his bargain bird directly to the nearest camp. At Eau Claire, Company C of the Eighth Wisconsin Regiment was being organised under the command of Captain John E. Perkins. The men of the Company admired the bird, McCann made a sale for 21 dollars and the Eau Claire outfit had a mascot. They dubbed the eagle "Old Abe" after their commander-in-Chief, Thereafter eagle and Company were to make each other famous. Once he had joined Company C, " Old Abe" became a legend almost overnight. Gifted with remarkable intelligence, he became a soldier among soldiers, more than a mascot, but an inspiration to the men around him. A little later, when Company C joined the Eighth Regiment at Madison, "Old Abe" became the mascot for the entire outfit. He was inducted into military service in a special ceremony, which included placing red, white and blue ribbons around his neck and a rosette of similar colours on his breast. He was carried on his perch in regimental parades and given a place of honour, in the very centre of the front ranks, alongside the flag. Throughout the bitter, unhappy struggle, "Old Abe" went through thirty-eight battles and skirmishes, and the Eighth Regiment became known as the Eagle Regiment. With his wild piercing cry, he was familiar to men on both sides of the fight and gained equal respect as one of the brave and courageous fighters. Old Abe's remarkable loyalty was known to all and on occasions he broke his bonds and winged swiftly away and disappeared. After a short interval of freedom, the kingly bird, his wings spread to a magnificent six and a half feet, would swoop silently down to his perch beside the flag. Ed Homiston was the big Bird's best known keeper and he never lost faith in him when he escaped his tethers. After the war, " Old Abe" appeared in many parades and reviews and received the cheers of the nation. He was quartered in the State House at Madison to spend his mature years and was visited by thousands annually. His last public appearance was in 1880 at a great reunion of veterans held in Milwaukee. There he shared the platform with General Grant. In the big parade Old Abe was a figure of magnificent dignity. When the band struck up a stirring march, he answered with his celebrated battle cry. The very next winter a fire broke out in the basement of the capitol where paints and oils were stored. Almost suffocated by heat and smoke, Old Abe never recovered from the Ordeal and the great eagle died on March 26 188I, following a memorable life. Stuffed and mounted in a glass case, he continued to attract attention long after his death. In February, 1904, came another fire, which destroyed even his remains. And now, in the new Memorial Hall, there are two oil paintings to keep fresh the memory of the fighting eagle who had Earned his place in the sun. Mr. Case first encountered the eagle in 1861 while on a business trip to Eau Claire. where Company " C "was parading. Over the rumble of, drums and the tramp of marching feet, the bird was screaming his battle cry. Mr. Case questioned a boy standing along side: 'Where did he come from "the eagle?' The boy told him Old Abe's story. Then and there Mr. Case determined to adopt Old Abe as the symbol of his business just as soon as the unhappy 'War was over. In 1865 Old Abe began his career as the most famous bird in agricultural history as the trademark of the J. I. Case Company. For nearly 100 years the Case Eagle has made its mark wherever men obtain their living from the soil. Today the Eagle trademark identifies Case machinery, parts, literature, branch houses and dealers. Just as Old Abe came through the battles of a long hard war to make a place for him self among the immortals, so has the J. I Case Company. 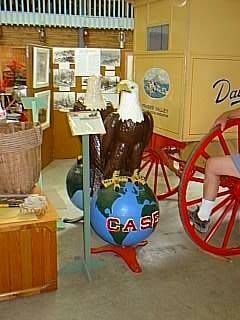 Case Co, has endured and survived battles of a different kind and come through the turmoil of more than a century to emerge as one of the Great leaders in the agricultural industry, Just as the image of the American eagle has come to represent and signify to many, prowess, freedom and strength. The name Case is a synonym for dependable and reliable, long lasting machinery.